I always associate holidays and Christmas with coconut, so I love to make Coconut Macaroons. Sweet and chewy, with golden, caramelized edges, these little macaroons will win your holiday heart. These are the cookies that people take a bite of, their eyes widen, and they mumble around the coconut and chocolate, "Oh, these are goooood!" 1. Preheat oven to 325 degrees. Line cookie sheets with parchment paper. In a small bowl, stir together vanilla and egg whites. Set aside. 2. Combine coconut, sugar, flour and salt in a large bowl. Mix well, separating clumps of coconut as necessary. Stir in egg whites and vanilla, combining thoroughly. Drop batter by tablespoonfuls about 2 inches apart onto prepared cookie sheets. 3. Bake for about 17 minutes, or until cookies are set and light golden brown. Transfer cookies to wire cooling rack to cool completely. 4. Melt chocolate and drizzle over cooled cookies. Allow chocolate to set. Cookies keep for several days in an airtight container. 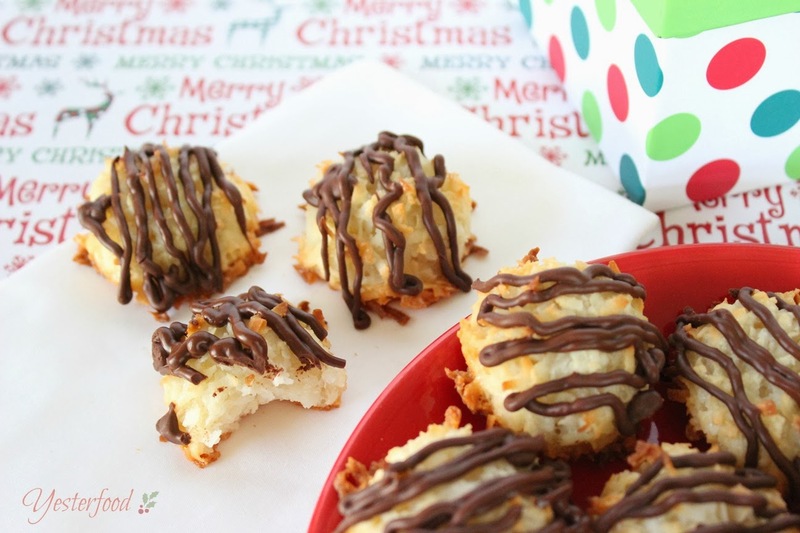 Coconut Macaroons are good at Christmas or anytime! Kris, I have had the same experience- I have made 2 or 3 other recipes, and did not care for them. One you had to whip the egg whites to stiff and then fold them in. "Ain't no one got time for that", lol! And they weren't even that good after all that. Another recipe was basically just coconut and sweetened condensed milk, also not very good. This recipe turned out really well, and they are so good...and it's easy. It's my keeper! If you try them, I hope you like them! OH one of my favorite cookies but I have never have made them! Putting them on my list now! Thank you, Heather! I loved your Dark Chocolate Chip Quinoa Cookies! I love coconut macaroons, but have never made them with chocolate on them. I am not sure I would have the patience to wait until the chocolate melted and I drizzled it on! Thanks for being a part of the Fill The Cookie Jar group and I am always happy to see what you are busy baking! I will admit to sampling some before I added the chocolate drizzle, Cynthia! ;) I love Fill the Cookie Jar- thank you for creating and running it! Joy, my husband would love these! He's a big time coconut person, but I'm not. I might surprise him with a plate of these for Christmas. Thanks for sharing. Joy, those look so good -- and I did print the recipe! This is one of Grampy's favorite cookies and I have never bothered to make them! Thank you! Joy - these macaroons are looking amazingly good!! Hi Joy, I'm a coconut lover and macaroons are one of my favorite cookies. l used to make them often but haven't made them in recent years. Thanks for sharing this and giving me some inspiration. Coconut macaroons are one of my favorites! And, I especially love them with chocolate. OMG...what a recipe to die for...I must try these. I have been wanting to make macaroons! Thank you for this recipe. I didn't realize that the sugar was relatively low as far as cookies go. Pretty awesome! 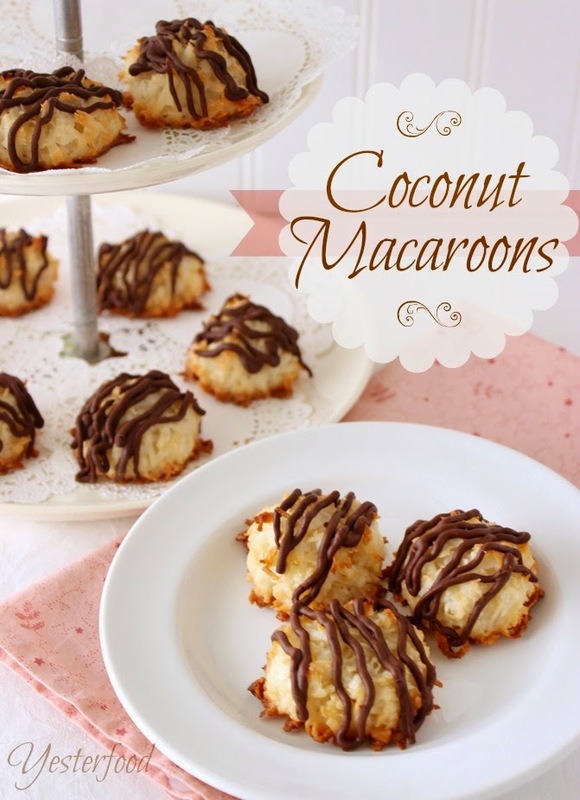 I love coconut but have never made macaroons myself, will have to give it a try. Thanks for linking up at the Home for the Holidays Link Party. Susan, this is the best and easiest recipe I've made- it's my keeper now. :) I've been enjoying Home for the Holidays- thank you! Coconut Macaroon!! Yum..I think I need to get in kitchen and try these out. What pretty cookies! I love the chocolate drizzle. These would be so perfect for all of those holiday get-togethers that happen this time of year. Coconut Macaroons remind me of my grandpa. He loved making and eating them. I never considered coconut macaroons to be beautiful cookies...but yours are, Joy! Hope you are staying warm! Thank you for linking. Oh, Michelle, thanks for telling me about your grandpa. That made me smile. I think you're right- coconut macaroons aren't the prettiest.....maybe they're one of those "ugly" but delicious foods you mentioned the other day! :) Thank you for See Ya In The Gumbo! Oh your macaroons look absolutely perfect!!!! I love coconut and love macaroons, and haven't had them in the longest time! These are making me want to make some!!! They look so delicious!!!! Thank you, Maria, you are so sweet! I hadn't made them in awhile, either, and I was so glad to get them back on the menu! :) Thank you for coming by! Thanks, Lynn- mine too! :) Thank you for hosting Four Seasons Blog Hop! Classic Macroons are among my favorites and these look great! I cannot wait to try these. I love coconut and this recipe looks delicious. Thank you for sharing it on our Four Seasons Blog Hop. Shawna, we really enjoyed them- it's my 'keeper" recipe! ;) Thank you so much for coming by, and for hosting the Four Seasons Blog Hop! What a great collection of cookies just in time for Christmas. Thanks so much for sharing with Full Plate Thursday and enjoy your weekend! Thank you so much Miz Helen! It's always fun to come to your house! :) I hope you have a great weekend! This type of coconut macaroons are my favorite, Joy...no sweetened condensed milk! They look delicious and they are even more amazing with chocolate. Adding these to my Christmas cookie list! Samantha, thank you so much! I never had good luck with sweetened condensed milk macaroons, although I think some people do. :) This is my keeper recipe! Thanks for coming by, and for hosting Moonlight and Mason Jars! G'day Look GREAT Joy, true! Have very fond childhood memories of too! Oh, Joy! These look so delicious! I remember my mother making chocolate macaroons when I was a child and they were my favourite, until she must've switched up the recipe or something and then they always ended up gooey and...oozy?...every time she tried to make them. Is there a secret to prevent that? I've actually never tried to make them myself. Perhaps one day soon I will. Thank you so much for sharing at Show Off Friday! Thank you, Jenn! I'm not positive what causes macaroons to ooze, but I have made other macaroon recipes that were like that. I haven't had good luck with recipes that call for sweetened condensed milk (I think some people do, though), and maybe there needs to be enough flour used. These macaroons are nice and moist without any oozing at all. :) Thank you so much for hosting Show Off Friday! I love macaroons and with chocolate added, they look even better. Great recipe...I want to try these. Thanks! Pinning to my Cookie board! I love macaroons! I've never dipped them in chocolate though - Noted :) Thanks for linking up with us at Freedom Fridays ... I've scheduled this to share on FB and pinned it! Thanks, Jamie- everything's better with chocolate, right? :) Thank you for hosting Freedom Fridays! 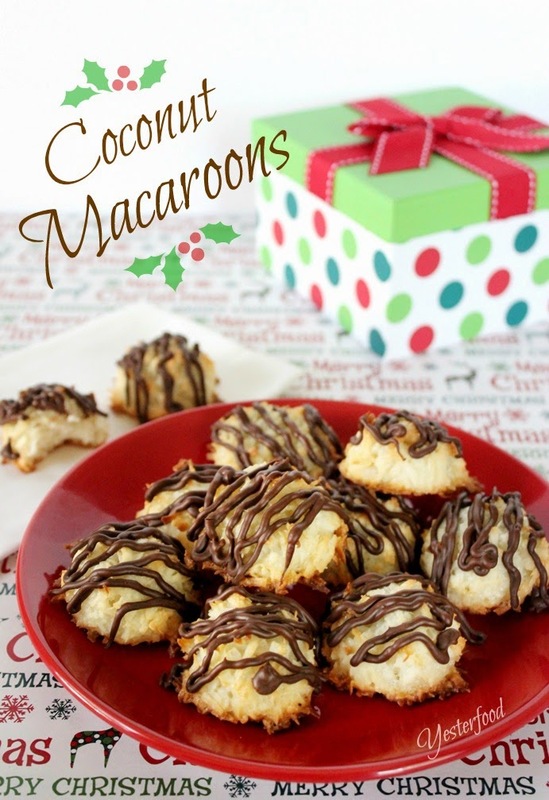 I love that coconut reminds you of the holidays, Joy, and these Classic Macaroons sounds DIVINE! I haven't had one in years, so I think it's high time that I checked them out again. Also, thanks so much for participating in Christmas Cookie Week! This is such a lovely holiday recipe for it! My hubby would love these! Thanks for sharing! Joy, I've always wanted to make macaroons - what a great recipe!! 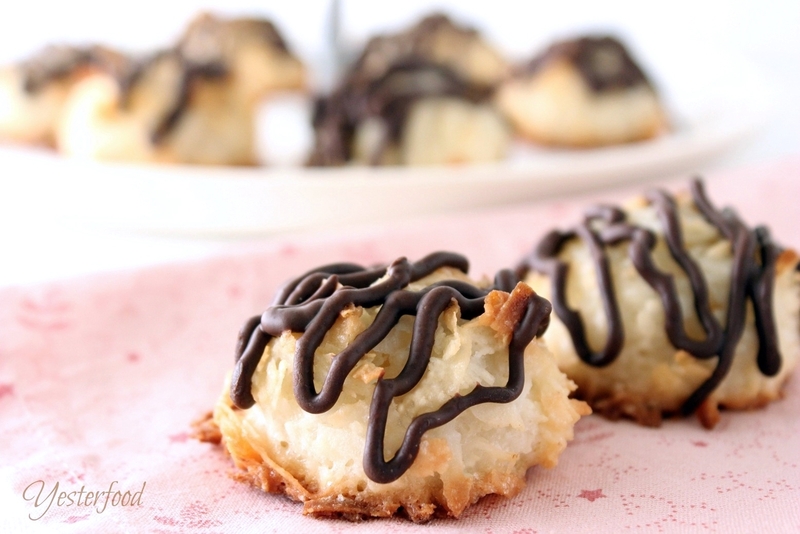 I absolutely adore coconut macaroons and the chocolate drizzle makes these even better! These look amazing! I love all things coconut and this is one of my very favorite treats!